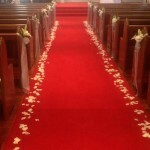 Tanya and Greg got married today in a local Church complete with a gorgeous red aisle and timber pews. 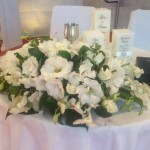 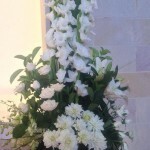 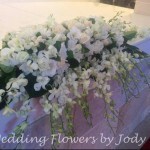 They chose some beautiful arrangements for their altar and candle table. 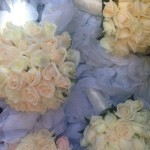 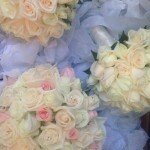 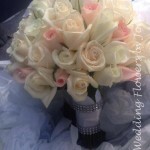 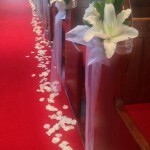 Be sure to get permission from your Pastor or Priest before ordering fresh flower petals for your aisle. 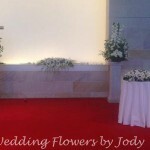 Some churches or even hire companies dont like the petals on their carpet. 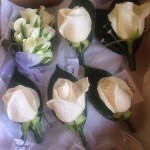 Some petals can stain, but we can get the same effect from dried petals and they can be swept up for pot pourri later.